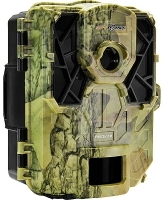 As featured in THE SCOTSMAN All trail cameras backed by my 100% Satisfaction Guarantee, and includes my Lifetime Backup & Support. 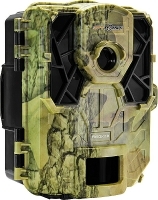 If you need help choosing a trail camera, just call me on 0333 9000 927. 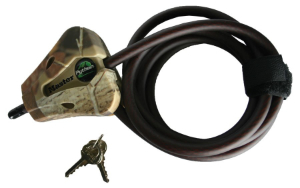 Get My FREE Ebook: "8 Things You Need to Know About Trail Cameras"
If you're like most of my clients you know a little about trail cameras and the way they work, but the varied choices available are a little confusing, to say the least! 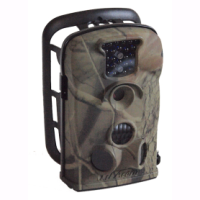 I use trail cameras all the time, and can help you to narrow down your options to make your choice of trail camera much easier. 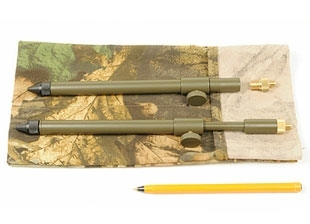 To help you I've written a guide called "8 Things You Need to Know About Trail Cameras" and if you click here you can get a free copy within minutes. 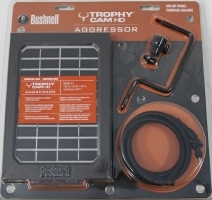 Take half an hour to read it and you should have a better idea of what you should be looking for in a trail camera for what you want to achieve. 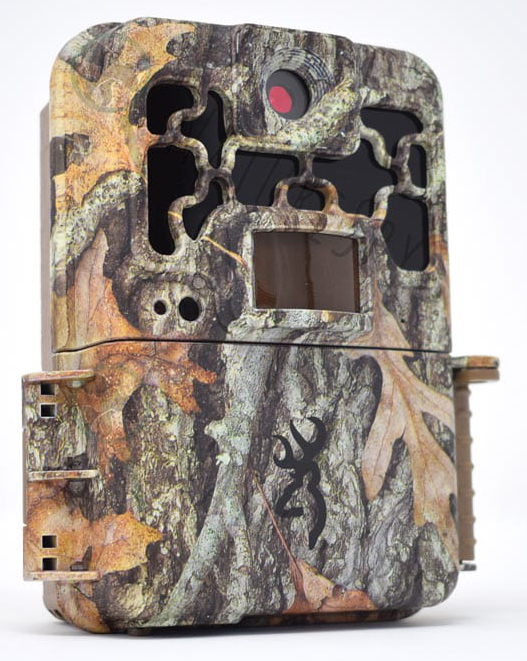 There are numerous manufacturers of trail cameras, but it's hard to decide on the right model for you. There are also many counterfeit cameras out there, as well as suppliers who'll tell you to send your camera back to China if it stops working. Let me help you to choose the right camera for your needs and when you buy from me you'll get my exclusive 60 day 100% Satisfaction Guarantee and Lifetime Backup & Support. I supply these cameras all over the world, to naturalists, scientists, conservationists such as the Scottish Wildcat Association, the Wildlife Trusts, Deer Initiative and Wildfowl & Wetlands Trust, councils, rail companies, security companies, Police, Ministry of Defence and others I can't mention. Scroll down the page and I'll help you to make your choice. If you want more information about the cameras and accessories just call me on 0333 9000 927 (leave a message if I don't answer and I'll call you back). 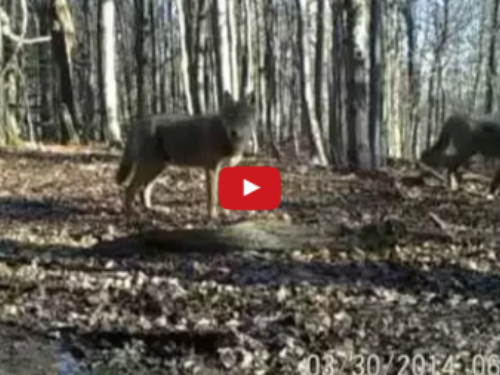 The sound on the wolf & lynx videos is caused by the MGX camera trying to communicate with the cellular network. 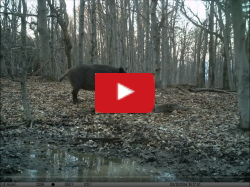 All videos/images taken with Acorn cameras in Magura National Park, Poland. Would you like to come with us? 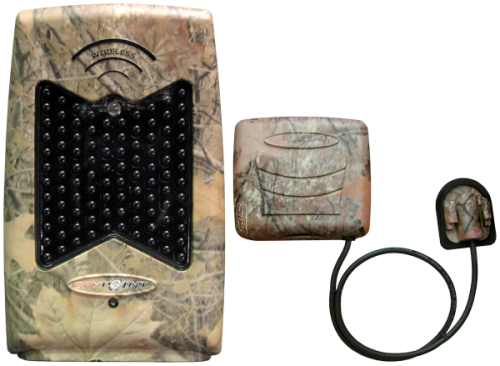 Browning trail cameras are now available and they will be added to the website as soon as I've had a chance to check them out and update the website. 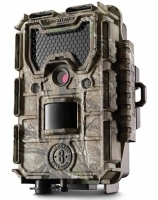 In the meantime, if you want a Browning trail camera, just click on support on the right of your screen and send me a message and I'll sort one out for you. This camera is great, well camouflaged and I've used it extensively in Poland and the UK. I retrieved a couple of Acorn 5210A cameras from a forest in south east Poland in February 2014. 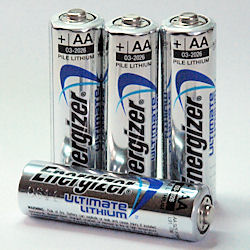 They'd been there for 8 months, using just 8 internal alkaline batteries, and were still working! One had nearly 700 images on it and the other had 3558 images, and had just taken a sequence of wild boar at a waterhole 8 minutes before I arrived! Terrific cameras. I replaced the batteries and SD cards and left them there for another 7 months. When we went back in October they were still working and had some lovely shots of wolf, lynx, wild boar and deer. Would you like to come to Poland with me next time? Click here for more information. I really like this little camera and its two-part design can be very useful, allowing you to view the screen, change the SD card and batteries without unstrapping the back from the tree. Great value at only £110 including UK delivery. Available as camera only or with 8 low self-discharge NiMH rechargeable batteries and 16GB SD card. This camera is a pleasure to use and quite discrete despite not having a camouflaged case. I really like this little camera, though I prefer the Force-11D with its camouflaged case and video with sound. Great value at only £150 including UK delivery. Available as camera only, or with 8 alkaline AA batteries and 16GB SD card, or with li-ion battery pack & charger with 16GB SD card (recommended). The Acorn 5310A offers 12 MP still pictures, 1080 resolution video with sound, a built-in 2.36” viewing screen (on the back of the front half of the camera), 0.8s trigger speed, time-lapse mode, up to 16m (48') flash range with 940nm no glow LEDs, 44 LEDs, multi-shot mode up to 3 photos per detection and/or video up to 60s. Takes 8 AA batteries and maximum 16GB SD card. With external power socket (cable below, in accessories). This camera is just like the 5210A but with more LEDs for greater night-time illumination. 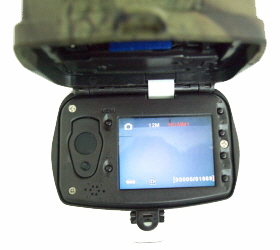 The two-part design of this camera can be very useful, allowing you to view the screen, change the SD card and batteries without unstrapping the back from the tree. Great value at only £120 including UK delivery. The Acorn 5610A offers 12 MP still pictures, 1920x1080 resolution video with sound, a built-in 2.36” viewing screen (on the back of the front half of the camera), 0.8s trigger speed, time-lapse mode, up to 18m (13.5m for wide-angle) flash range, 44 no glow LEDs, multi-shot mode up to 3 photos per detection and/or video up to 60s and GPS coordinates input capability. Takes 12 AA batteries and maximum 32GB SD card. With external power socket (cable below, in accessories). This camera is just like the 5310A but with higher resolution video, a larger maximum capacity SD card, larger battery capacity and GPS coordinates input capability. 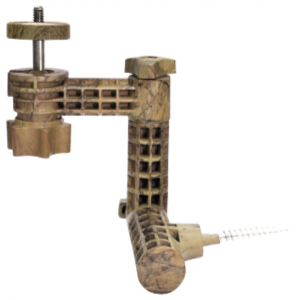 Great value at only £135 including UK delivery. Available as camera only or with 12 low self-discharge NiMH rechargeable batteries and 16GB SD card. 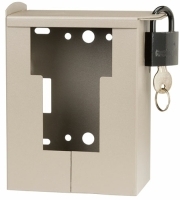 The Acorn 6210MC offers 12 MP still pictures, 1440x1080 resolution video with sound, a built-in 2” viewing screen (in the bottom door), 0.8s trigger speed, time-lapse mode, up to 10m (30’) flash range with 940nm no-glow LEDs, 24 LEDs, multi-shot mode up to 3 photos per detection and/or video up to 60s. Takes 12 AA batteries and maximum 32GB SD card. With external power socket (cable below, in accessories). 14 H x 9 W x 6.5 D (cm). This camera has higher video resolution than the 5210 & 5310 and takes 12 AA batteries for longer deployment. The screen can be used to help aim the camera. Great value at only £140 including UK delivery. 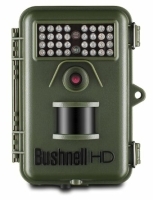 The Bushnell 119739 offers 12 MP still pictures, 1280x720 resolution video with sound, a text LCD display, 0.3s trigger speed, time-lapse mode, up to 24m (70’) flash range, 32 LEDs that glow, multi-shot mode up to 3 photos per detection and/or video up to 60s. Takes 8 AA batteries (not rechargeable). This camera is reliable, but a bit obtrusive with its green case and it doesn't have a view screen to view images and videos. Great value at only £190 including UK delivery. Available as camera only or with 8 Energizer Lithium batteries and 16GB SD card. The Browning Spec Ops Advantage offers 20 MP still pictures, 1920x1080 resolution video with sound, a 2" colour display, 0.4s trigger speed, time-lapse mode, up to 60ft flash range, no-glow LEDs, multi-shot mode up to 8 photos per detection or video up to 120s (20s at night). Takes 8 AA batteries (not rechargeable). This camera is very easy to use and produces excellent images and really great videos. Despite not using rechargeable batteries or having a timer, if you want great videos this is the one to get! 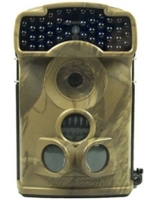 The Spypoint Force-11D offers 11 MP still pictures, 1280x720 resolution video with sound, a built-in 2” viewing screen with zoom and pan functions, 0.07s trigger speed, time-lapse mode, up to 30.5m (100’) flash range, 42 super low glow LEDs, multi-shot mode up to 6 photos per detection and automatic infrared level adjustment. Takes 6 alkaline AA batteries and maximum 32GB SD card. 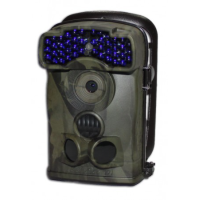 This camera is really easy to use and very unobtrusive with its camouflaged case and super low glow LEDs. I really like this little camera and I think it's my favourite of all the Spypoint range. The Acorn 6310MC offers 12 MP still pictures, 1440x1080 resolution video with sound, a built-in 2” viewing screen (under the back cover), 0.8s trigger speed, time-lapse mode, up to 16m (48') flash range with 940nm no glow LEDs, 44 LEDs, multi-shot mode up to 3 photos per detection and/or video up to 60s. Takes 12 AA batteries and maximum 32GB SD card. With external power socket (cable below, in accessories). This camera has higher video resolution than the 5210 & 5310, more LEDs than the 6210 and takes 12 AA batteries for longer deployment. Great value at only £155 including UK delivery. The Spypoint Solar offers 12 MP still pictures, 1280x720 resolution video with sound, a built-in 2” viewing screen with zoom and pan functions, 0.07s trigger speed, time-lapse mode, up to 30.5m (100’) flash range, 42 no glow LEDs, multi-shot mode up to 6 photos per detection and automatic infrared level adjustment. Takes 6 alkaline AA batteries and maximum 32GB SD card. 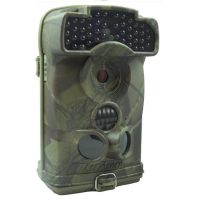 This camera is really easy to use and very unobtrusive with its camouflaged case and no-glow LEDs, plus it has a very long deployment time due to the in-built solar panel. Potentially a very useful camera for anyone who needs long deployments. Great value at only £240 including UK delivery. Available as camera only, or with 8 alkaline AA batteries and 16GB SD card, or with li-ion battery pack & charger (recommended) with 16GB SD card. 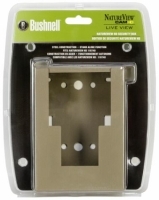 The Bushnell 119877 offers 24 MP still pictures, 1920x1080 resolution video with sound, a colour viewer, 0.2s trigger speed, time-lapse mode, up to 30m (100’) flash range, 48 no glow LEDs, multi-shot mode up to 3 photos per detection and/or video up to 60s. 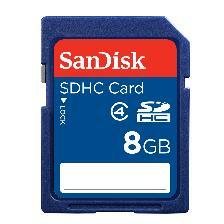 Takes 8 AA batteries (not rechargeable) and up to 32GB SD card. 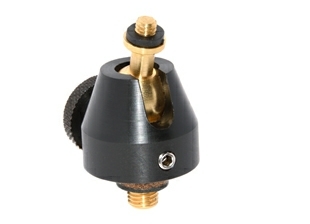 This camera is reliable and easy to use. Great value at only £280 including UK delivery. 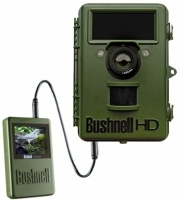 The Bushnell 119740 offers 14 MP still pictures, 1920x1080 resolution video with sound, a LiveView external screen, 0.7s trigger speed, time-lapse mode, up to 18m (60’) flash range, 32 no glow LEDs, multi-shot mode up to 3 photos per detection and/or video up to 60s and two close-up lenses (46 & 60cm). Takes 12 AA batteries (not rechargeable). This camera is reliable, but a bit obtrusive with its green case. Great value at only £350 including UK delivery. 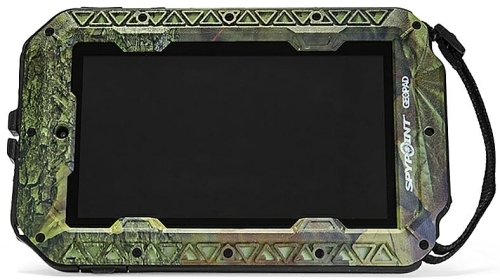 Available as camera only or with 12 Energizer Lithium batteries and 16GB SD card. The Acorn 5210MGX offers 12 MP still pictures, 1080 resolution video with sound, a built-in 2.36” viewing screen (on the back of the front half of the camera), 0.8s trigger speed, time-lapse mode, up to 10m (30’) flash range, 24 no glow LEDs, multi-shot mode up to 3 photos per detection and/or video up to 60s, external antenna and can send images to mobile phone or email. Takes 8 AA batteries and maximum 16GB SD card. With external power socket (cable below, in accessories). 22 x 9 x 6.5 cm (inc antenna). This is a great little camera, well camouflaged and I've used it extensively in Poland and the UK. Great value at only £210 including UK delivery. The Acorn 5310A offers 12 MP still pictures, 1080 resolution video with sound, a built-in 2.36” viewing screen (on the back of the front half of the camera), 0.8s trigger speed, time-lapse mode, up to 16m (48') flash range, 44 no glow LEDs, multi-shot mode up to 3 photos per detection and/or video up to 60s. Can send images to mobile phone or email and has an external antenna. Takes 8 AA batteries and maximum 16GB SD card. 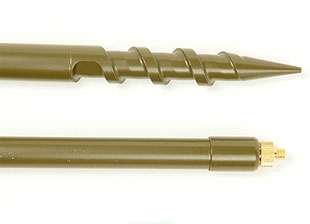 With external power socket (cable below, in accessories). This camera is just like the 5210MGX but with more LEDs for greater night-time illumination. Great value at only £225 including UK delivery. 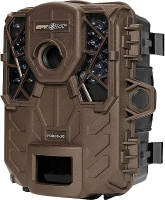 The Acorn 6210MGX offers 12 MP still pictures, 1440x1080 resolution video with sound, a built-in 2” viewing screen (in the bottom door), 0.8s trigger speed, time-lapse mode, up to 10m (30’) flash range, 24 no glow LEDs, multi-shot mode up to 3 photos per detection and/or video up to 60s. 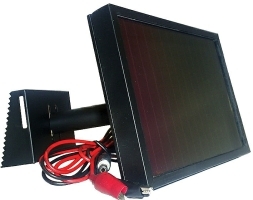 Can send images to mobile phone or email and has an external antenna. Takes 12 AA batteries and maximum 32GB SD card. With external power socket (cable below, in accessories). 22 x 9 x 6.5 cm (inc antenna). Great value at only £260 including UK delivery. The Acorn 6310MGX offers 12 MP still pictures, 1440x1080 resolution video with sound, a built-in 2” viewing screen (under the back cover), 0.8s trigger speed, time-lapse mode, up to 16m (48') flash range, 44 no glow LEDs, multi-shot mode up to 3 photos per detection and/or video up to 60s. 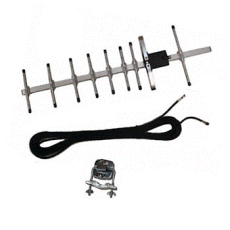 Can send images to mobile phone or email and has an external antenna. Takes 12 AA batteries and maximum 32GB SD card. With external power socket (cable below, in accessories). Great value at only £270 including UK delivery. The Acorn 6310MGX-3G offers 12 MP still pictures, 1440x1080 resolution video with sound, a built-in 2” viewing screen (under the back cover), 0.8s trigger speed, time-lapse mode, up to 16m (48') flash range, 44 no glow LEDs, multi-shot mode up to 3 photos per detection and/or video up to 60s. 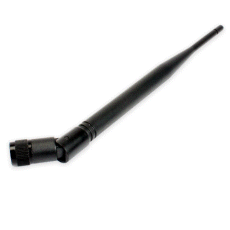 Can send images/video to mobile phone or email via 3G and has an external antenna. Takes 12 AA batteries and maximum 32GB SD card. With external power socket (cable below, in accessories). This camera can send images/video via the 3G network, unlike other Acorn MGX cameras which only send images with 2G. Great value at only £450 £360 including UK delivery. The Spypoint LINK-EVO offers 12 MP still pictures, 1280x720 resolution video without sound, no viewing screen, 0.3s trigger speed, time-lapse mode, up to 90ft flash range, 42 low glow LEDs, multi-shot mode up to 2 photos per detection and automatic infrared level adjustment. Takes 8 AA alkaline batteries and maximum 32GB SD card. This camera can also send its recorded images via 4G to your smartphone or email. SIM card included with one month free. Subscription options. Great value at only £330 including UK delivery. 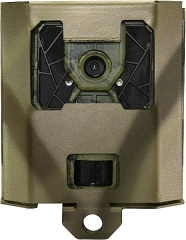 The Spypoint LINK-DARK offers 12 MP still pictures, 720p resolution video with sound, 2 inch viewing screen, 0.07s trigger speed, time-lapse mode, up to 80ft flash range, 42 no glow LEDs, multi-shot mode up to 3 photos per detection and automatic infrared level adjustment. Takes 8 AA alkaline batteries and maximum 32GB SD card. This camera can also send its recorded images to your smartphone or email. SIM card included with one month free. Subscription options. Great value at only £400 including UK delivery. The Spypoint LINK-S offers 12 MP still pictures, 1280x720 resolution video with sound, 2-inch viewing screen, 0.07s trigger speed, time-lapse mode, up to 30m (100ft) flash range, 42 super low glow LEDs, multi-shot mode up to 3 photos per detection and automatic infrared level adjustment. Takes 8 AA alkaline batteries and maximum 32GB SD card. This camera can also send its recorded images to your smartphone or email and has a solar panel built in to increase deployment times. SIM card included with one month free. Subscription options. Great value at only £550 including UK delivery. 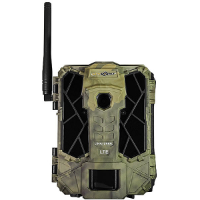 The GeoPad brings trail camera specific applications to hunting, wildlife and security enthusiasts in a rugged package with all the features found on a regular ‘indoor’ tablet. 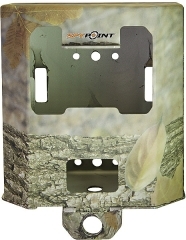 The Spypoint Li-ion battery pack and charger fits all the Spypoint trail cameras and saves having to replace alkaline batteries all the time (Spypoint don't recommend AA rechargeable batteries for their cameras). 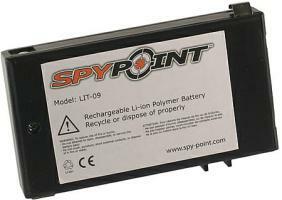 The Spypoint spare Li-ion battery pack, when bought with the Li-ion battery pack and charger, allows you to have a spare charged battery so you can easily re-power your Spypoint camera in the field, for longer deployments. 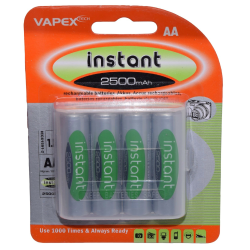 I recommend the low self-discharge rechargeable batteries for the Acorn cameras and the most cost-effective is the Vapex Instant below that I supply with my Acorn cameras. 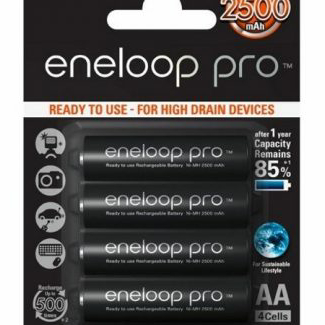 Alternatively, the Panasonic Eneloop rechargeables are extremely good. 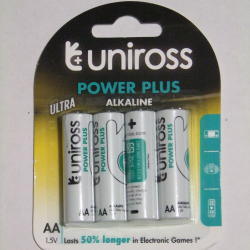 The Spypoint and Bushnell cameras are not recommended to be used with AA rechargeables, so if you want to use AA batteries, the Uniross alkaline or Energizer Lithium batteries below are recommended (or use the li-ion battery pack for Spypoint cameras). Don't use Duracell or some other alkaline batteries as their high internal resistance makes them unsuitable for trail cameras. 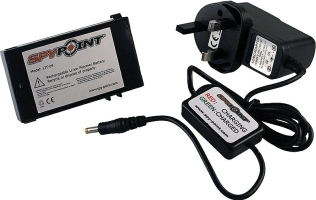 If you would like to use an external power supply, you'll see a lead below for connecting an SLA battery to Acorn cameras, or contact me to ask about other options as I can supply mains power adaptors and also external li-ion battery packs. 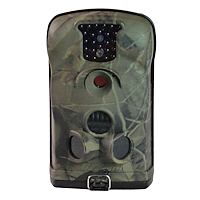 Specially designed padded neoprene bags for trail cameras. 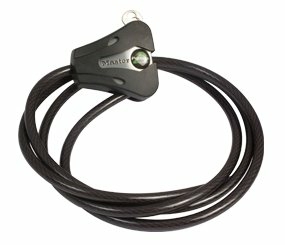 The draw cord bag is quick and easy to use, perfect for carrying out in the field and storing the camera back at base. 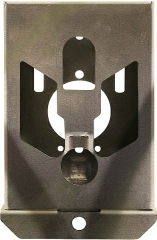 To suit trail camera size 17cm x 13cm x 8cm. 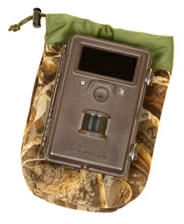 Suits Acorn 3310, 5210, 5310, 5610, 6210, 6310 and Bushnell Trophy and Nature View cams. The IR-Booster is a wireless device used to optimize the infrared lighting to accentuate the quality of night-time photos and videos. 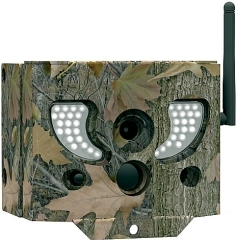 The wireless IR booster works with most trail cameras, but when used with Spypoint REMOS compatible cameras, the transmitter (included with the device) is not necessary. Triggered by a wireless transmitter (included). Compatible with most infrared cameras. 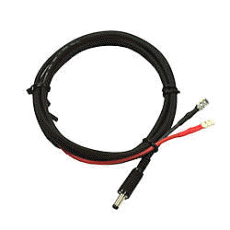 Invisible LEDs IR-Booster; Transmitter; Installation strap; User manual. All cameras include our 60 day 100% Satisfaction Guarantee, 1 year manufacturer's warranty and Lifetime Backup & Support. 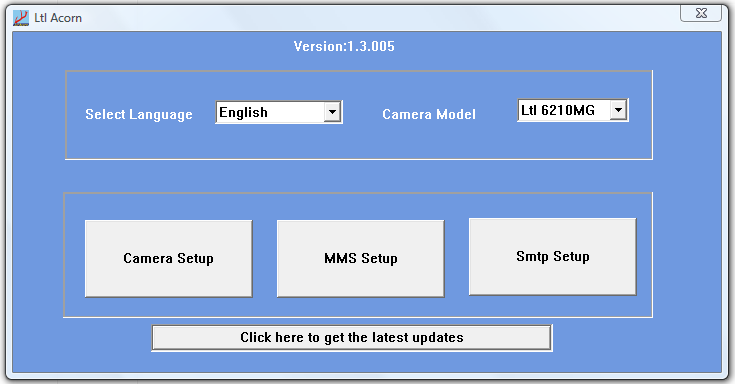 Click on the button for Camera Setup, set the settings, connect an SD card to your computer, select the SD card drive then select Generate. 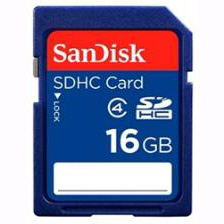 This will save the Camera Setup file on the SD card. 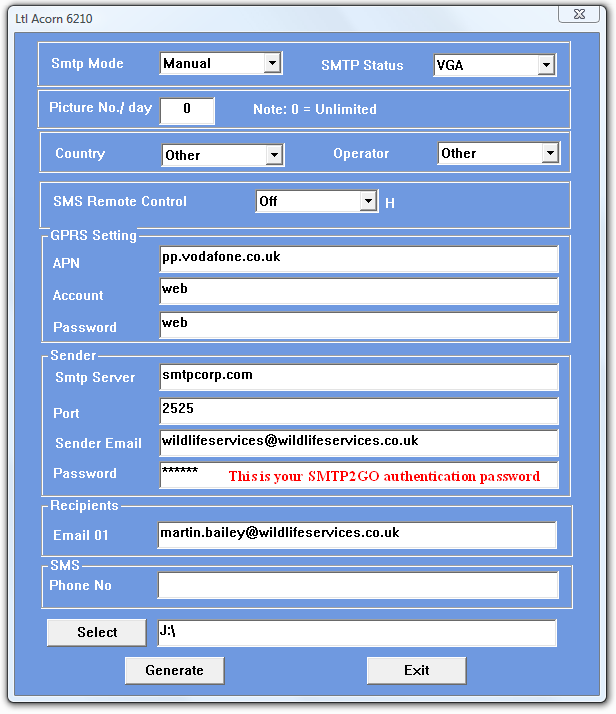 If you have an MMS/SMTP camera, click on Exit, then click on the MMS or SMTP button as appropriate (we recommend the SMTP method, but you'll need to set up your SMTP2GO account first, bearing in mind the 'rule' above about the Username). Set the settings as appropriate using Figure 3 or 4, then select the SD card drive as before, then select Generate. This will save the MMS or SMTP Setup file on the SD card. 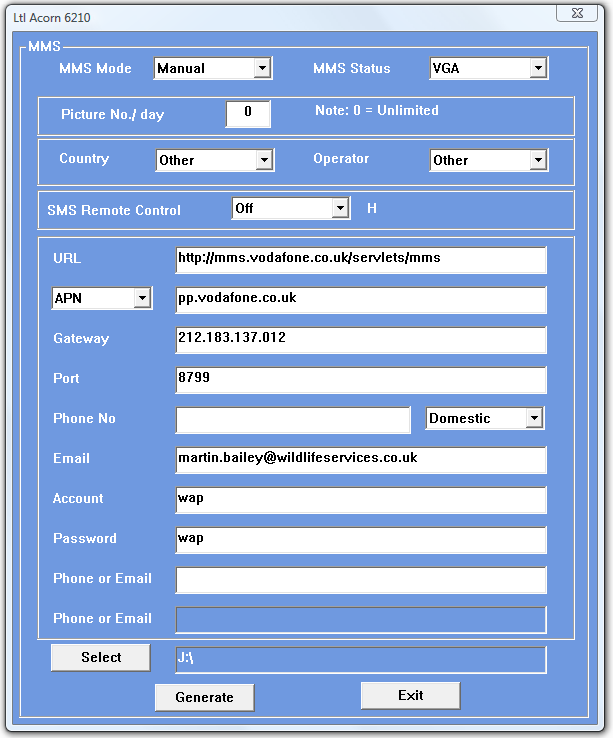 You should use the MMS setup OR the SMTP setup, NOT both. When you have the setup files you require on the SD card, simply put the SD card into your camera and switch to Test. You should see the Update text flash briefly on the screen for each setup file on the card. If you've done everything correctly, your camera should be set up and ready to go!